According to Wikipeida: the scone is a small British quick bread, traditionally hailing from both Scotland and the South West England. They are usually made of wheat, barley or oatmeal, with baking powder as a leavening agent. But let's face it, the scone or it's close cousin, is everywhere! I am quite sure that if we were making them in Scotland, then they were making them in Ireland at the same time. But that is not why these particular scones are Irish, it's because the lovely Kelly at Food Matters asked me to try out a few products from artisan food producers in Ireland for St Patricks Day. I am fortunate that I can eat pretty much everything with no ill effects (other than my expanding waistline!) however, I know quite a few people who are intolerant to wheat and gluten. 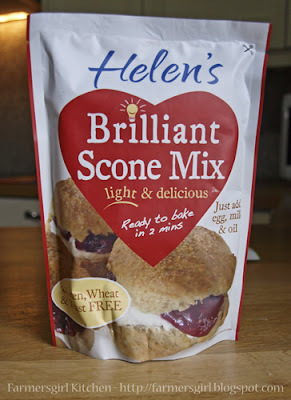 So I was interested to see how 'Helen's Brilliant Scone Mix' turned out. The mixes come from Virginia Health Ltd in County Cork, a family company supplying milled seeds such as flaxseed, hemp seeds, sunflowerseeds, pumpkinseeds and protein powders direct from the farm to your table for everyday use. Helen O'Dowd, the founding director, is a busy mum, nutritionist and food scientist. As well as the seeds Helen's Healing Foods features two gluten free bread mixes and the scone mix. I was also given the sandwich loaf mix to make, but unfortunately I read the instructions wrong and made a bit of a disaster! Nothing to do with the mix, totally my error. The scone mix is very easy to make up you just add an egg, 28g melted butter or vegetable oil and 200ml buttermilk or whole milk or soya milk and mix together with the dry ingredients in the pack. 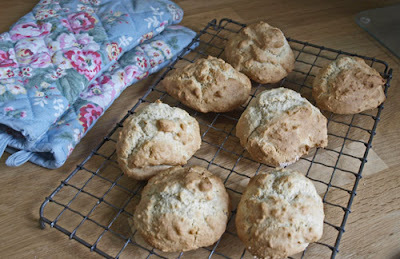 It is a much wetter mixture than the usual scone mix so you spoon the batter onto your baking tray rather than cut out the scones with a cutter. I put the scones in the oven with some trepidation, but they rose beautifully and were light and tasted good. Not quite the usual scone taste but my MIL approved and pronounced them 'frush' which means they crumble but are not dry! 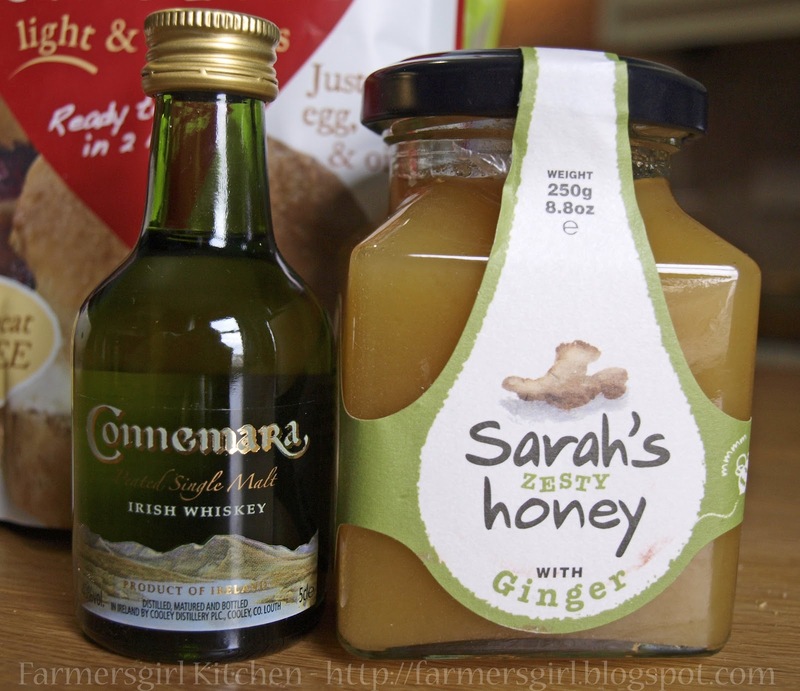 I was also provided with a jar of Sarah's Zesty Honey with Ginger from Mileeven Fine Foods in Kilkenny and a little bottle of Connemara Peated Single Malt Irish Whiskey. 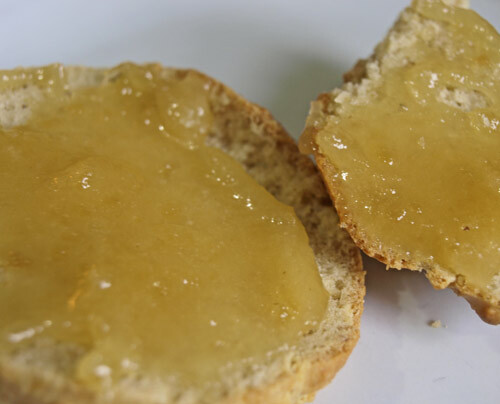 I wasn't quite sure about flavoured honey, but tried it out on one of the scones and it was quite good. I don't really think honey needs any extra flavour but it was a bit of a novelty. Anyway I thought I'd see what it was like in cooking and see if I could make a dessert from the ingredients I'd been provided with. 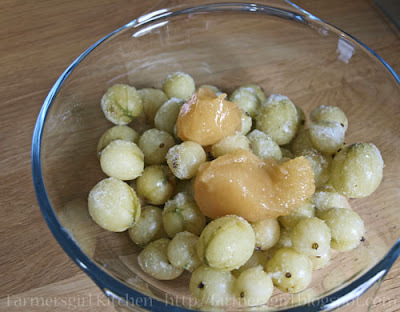 I had a few gooseberries left in the freezer from last summer, so added a tablespoon of the ginger honey to them and put them in the oven on a low heat for about 40 minutes until the gooseberries had softened and cooked through and the honey melted into them to make a sweet, gingery sauce. I whipped up some cream and added a tablespoon of the Irish Whiskey (I had a little chef's taste of the Whiskey and approved, not as good as Scottish Malt Whisky of course ;-) and a teaspoon of the honey and folded them through. 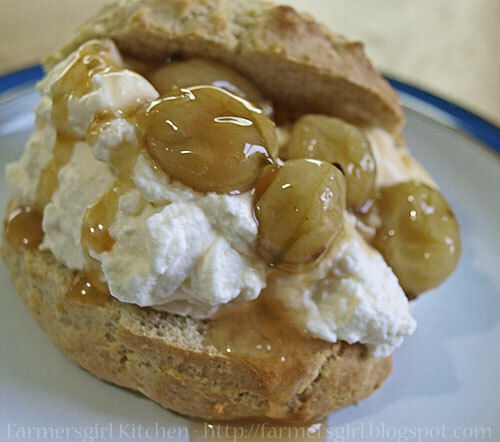 Then I split open the scone, piled on the cream, a few of the gooseberries and a drizzle of the honey syrup. It worked brilliantly, and I would certainly use the ginger honey in cooking, it suggests on the jar that it would be good in stir fries and I can imagine that it would be. This month's Tea Time Treats has Scones as the theme, so I'm entering my Honey Gooseberry Scones as an indulgent tea time treat! It's hosted this month by Karen at Lavender and Lovage the challenge is hosted alternately by What Kate Baked why not join in? I had a few of these Irish goodies after an event at Irish embassy couple of years ago and it was surreal that there was all this stuff with packets printed in English but you didn't recognise any of it!! I am quite a amused by Sarah's zesty honey! Not seen that one before! Lucky you! 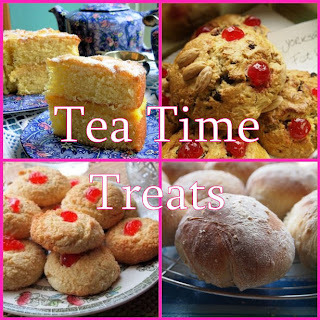 Those scones look wonderful and are a fab entry into TTT this month thanks Janice! Happy St Patrick's day. I'm really interested in finding good gluten free ingredients for a friend. These scones look and sound delicious, and I love the idea of honey and gooseberries.